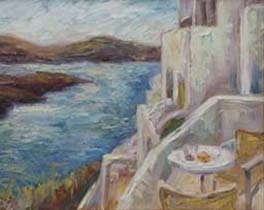 I painted this peaceful scene on the last day of our Plein Air Painting and Photography Workshop in Santorini, Greece. Having loved taking in this view from our balcony for the past several days, I just had to capture that gorgeous overlook on canvas. With its beauty, white-washed buildings and the deep blue Aegean background, Santorini is one of the most romantic places we have visited. The table set for two invites you and your loved one to relax, enjoy a glass of wine and let all of your cares slip away. Paradise! Please check out my website at NikiGulley.com to see more of my contemporary impressionistic paintings.